The violence witnessed in Charlottesville, Virginia just one week ago was both terrifying and familiar. Terrifying that in the year 2017 Neo-Nazis and White supremacists feel sufficiently emboldened to take to the streets with their message of hatred and exclusion. Familiar because for far too many Americans, who just so happen to be people of color, Jewish, Muslim, LGBTQ, women, or immigrants, Charlottesville was a demonstration of the ever-present shadow side of America that has deep roots in the preservation of privilege and power. As social workers, we dedicate our professional lives to opposing violence and social, political and economic injustice of any kind. Fighting against these realities is not only a professional calling, for most us, it’s also deeply personal. We recognize that, for all of the strength and opportunity that is America, the lives of many individuals and families in our communities continue under the burden of a history of insidious oppression and racism. Most importantly we recognize that what manifested in Charlottesville was some of the darkest periods of our past coming into the present. …my heart goes out to the intended targets and victims of the march, victims who number in the millions, and who include marginalized people everywhere, and anyone who cares about decency, compassion, and justice. Fordham University stands against everything the marchers represent—the hate, the bigotry, the profound ignorance, the casual cruelty, and the violent and vicious expression of those views. The response to the terrorism in Charlottesville from our nation’s leaders stands in stark contrast. The undeniable digital evidence and the unimaginable truth is that the initial reaction of President Trump and his administration was not to denounce and confront the perpetrators of racism, violence, and hatred, but rather to craft a narrative that feeds a growing tolerance for ‘alternative facts’ and false equivalencies. As outrageous as this feels to me, to my colleagues, and to millions of American citizens, we must not be naive. This narrative is entirely consistent with a spreading perspective of protectionism and exclusion powerful enough to democratically vote this administration into the White House last November. 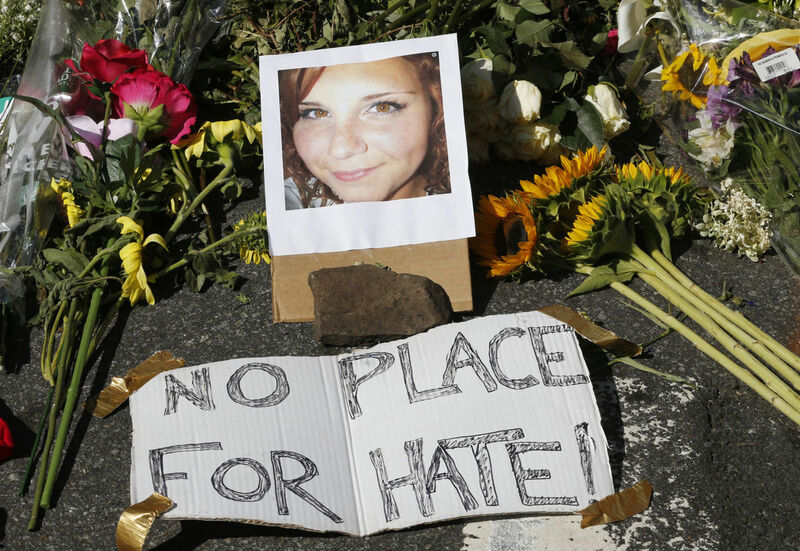 It seems to me that this is the real message of Charlottesville – that what is unacceptable and horrifying to many Americans is becoming increasingly acceptable to many others. From executive orders closing our nation’s borders to new immigrants to administrative actions denying services to the poor, we’re witnessing intolerance repackaged as beneficial national policy. It’s a message that is resonating and finding support from the most unlikely individuals – our neighbors, our parents, our friends, and co-workers. People who look and act nothing like the heavily armed Neo-Nazi extremist we saw marching in the streets of Charlottesville last Saturday. If messages of oppression and intolerance are resonating with growing portions of the American population, we must challenge ourselves, and others, to pay a great deal more attention to the underlying social, political, and economic forces at play. One has to assume that messages of intolerance are gaining support born of a genuine sense of fear and powerlessness that has always been a side effect of the American economy – but mostly for the few rather than the many. As social workers, we must speak out against prejudice and intolerance at every opportunity, but our responsibility cannot end there. Fear and ignorance don’t diminish because we shout more loudly than the fearful or the ignorant. History has taught us the unimaginable horrors of allowing the promotion of dichotomous thinking among populations of fearful and uncertain people grappling with a changing world. To be clear, I am not suggesting we give hatred and intolerance a platform. Rather I am advocating that leadership is greatly needed to help elevate the dialogue regarding race, equity, and inclusion. I believe social workers are capable and committed enough to provide this leadership – to help shift perspectives away from the dangerous divisions of for or against and us versus them. To this end, our relationships and our organizations must themselves serve as models of equity and inclusion. We must be willing to respectfully engage one another, as well as those who do not think as we think, who do not share our professional beliefs, our political beliefs or our lived experience. Last academic year I challenged the Graduate School of Social Service community – faculty, administrators, staff, students, alumni and professional colleagues – to seek new and creative ways to take action against racism and oppression. The response was inspiring. From the political to the artistic, we watched as individuals and groups engaged in powerful actions in our classrooms, in our communities and at the national level. As we begin this new academic year, I want to challenge us all to extend our efforts. Whether in our homes, our places of work, our communities, or our classrooms, social workers have an opportunity to elevate the conversation away from dangerous and divisive bi-partisan rhetoric toward open, inclusive and authentic dialogue. Perspectives of difference aren’t easily reconciled, and honest dialogue is always difficult. Nevertheless, I’m confident in the traditions of our profession, in the healing power of connection and in the skill of social workers to provide the leadership our communities need. I invite all members of our School and professional community to lead with compassion and commitment to elevate our dialogue about race, equity, and inclusion. As a social worker, and in my role as Dean, I pledge to do everything I can to resources and support your courageous efforts.